Another resurrected design from the boys at Asheville Steel. This automatic knife from Paragon fires hard! This knife features a beautiful ergonomic 6061 aluminum handle that looks and feels superb. 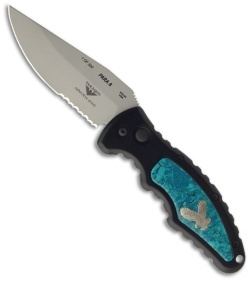 An eagle charm has been placed into the turquoise insert on the knife's front (the back has a neoprene insert). The ATS-34 steel blade is bead blast finished with a partially serrated edge. 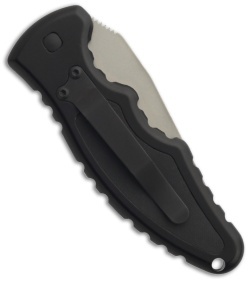 Pocket clip for easy carry (tip-down). Lanyard hole. Made in the USA and new in box. This is a limited run of 300.